TS Model Schools 6th class, inter 1st year selection list, tsms merit list, tsms 6th class admission test results, ts model schools inter admissions selection list, tsms cet results: DSE and Ex Officio PD, TS Model Schools:: Model Schools Admissions to VI to Intermediate I year for the Academic Year 2017 - 17 in 182 Model Schools - Instructions to all the DE Os in the State (except Hyderabad District) and respective Principals of Model Schools- schedule issued. Reference: G.O.Ms.No.24, Education (SE-PROG.I)Department, dated 10.06.2016 - Guidelines and procedure for admissions of students into Model Schools. With reference to the subject cited all the Principals of Model Schools in the State are informed that, vide ref. 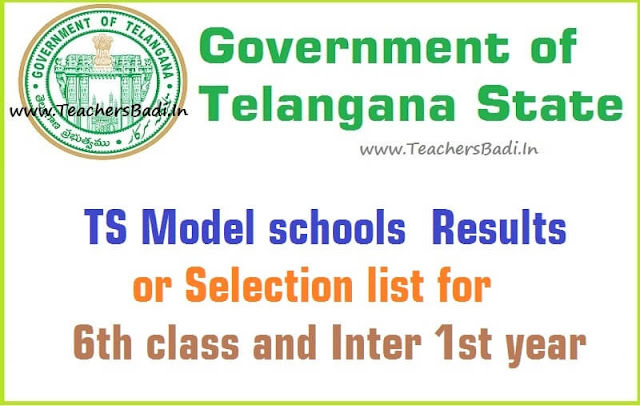 cited, the Guidelines and procedure for admission of students in to Model Schools in Telangana State change of admission pattern VI and Inter I year is changed from the academic year 2016-17 onwards. According to this selection list for the classes VI and Intermediate I year shall be prepared by this office and will be communicated to the Principals of the Model Schools. For the classes VII to X Principals are requested to prepare the selection list at the school point duly verifying the roaster according to the vacancies available and to submit to this office by 02.07.2016 for approval. Hence, all the Principals of Model Schools in the State are requested to act accordingly for smooth functioning of the Admission process for the academic year 2016-17 for the classes VI to Intermediate I year.